When someone has had to make the decision to place a loved one in a nursing home or an assisted living facility, that decision is typically very difficult and made after a great deal of care, consideration, and research. It simply is never an easy thing to do. However, when it becomes necessary, families are literally entrusting a nursing home or assisted living facility staff with their loved one’s life and well-being. The elderly are the most vulnerable segment of society and the care they need can be extensive and vital. There are certain standards of care that are expected and also standards of care that these facilities are legally bound to provide. 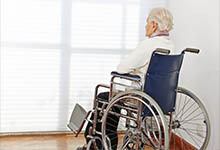 When a nursing home or facility has not lived up to what they have promised and what they are legally expected to, you may have cause to pursue a nursing home negligence suit. Nursing home negligence can have devastating and long-lasting consequences. There are a number of common reasons nursing homes end up neglecting a family’s loved one. The most common is inadequate staffing. Poorly trained or unqualified staff also can lead to the negligent care and well-being of your family member. Negligence also comes in the form of a facility not providing needed services or medical care. A lack of oversight or a failure to report medical problems is also a cause of neglect. There are a number of indicators of nursing home negligence. Some severe cases can inflict personal injury to the patient and even wrongful death. Any other signs that they simply are not getting the standard of care expected and needed. Any kind of neglect of care can lead to the further complication of existing health issues. It can also be difficult to prove negligence, especially if the patient or resident suffers from any cognitive or memory issues, such as dementia or Alzheimer’s. However, many families will report a “gut feeling” that leads to action. When it comes to proving that gut feeling, you need a compassionate Massachusetts nursing home negligence attorney who will take the time to get to know your situation and will diligently pursue the truth. The law firm of George C. Malonis will work to secure medical records and charts to verify care needed and care given, secure the assistance of medical experts to further clarify or explain the health aspects and consequences of the negligence, and work to ensure your loved one gets the care they need. Nursing homes are extremely expensive and it can be difficult and complicated to move a loved one to another facility if necessary. We will fight to protect the rights of your loved one and also help secure a settlement that ensures their needs will continue to be met. With so much at stake, letting George C. Malonis fight for you and your loved one is the first step to ending the occurrence of negligence and also ensuring your loved one never suffers again.